Today I'm going to reminisce a bit about Christmas in the 90s and list off the games I played on Christmas day from 1990 through 1999. Ho ho ho and all that! Merry Christmas! Christmas morning growing up was always an awesome time. According to my girlfriend, I was a spoiled only child, and judging from pictures taken on Christmas day, I'm starting to believe she might be right. Each picture is always a mountain of presents spilling out from beneath the tree and a sleepy but excited little boy sitting beside it waiting to tear into them. My memories of those days aren't always that clear, especially the further back I go, but I have pieced together a list of what games I received and what I was playing on Christmas day all those years ago. I didn't include anything from before 1990 because, honestly, that point is a bit hazy. I have some pictures of me opening up Ninja Gaiden and I remember bio-dad got me the original Castlevania one year and Super Mario Bros. 2 another year. And just to clarify, the games listed below are all games I actually asked for. So if you see something questionable, remember that I did actually ask for it and it wasn't some random game a family member gave me. So let's begin! Christmas of 1990 is one of my favorite Christmases of all. It was this Christmas that my parents got me a box of comics for the beginning comic book collector. I was already kind of into comics at this point, but this gift really set me down the path. They also got me a phone with a blue neon light in it. I used it as a night light for several years until it burned out, but even today I find the glow of blue neon to be soothing. Castlevania 3 was the game I played most from this batch. I know I was a bit disappointed in Ninja Turtles 2 because I found it to be a bit too difficult. Eventually I got better at it and enjoyed it more, but Castlevania was the real winner here. Also, forgotten about until I looked at a picture from this morning, is Teenage Mutant Ninja Turtles: Fall of the Foot Clan for Game Boy. Double Dragon was a Christmas present from bio-dad. I had actually asked for the NES version of Double Dragon, and for some reason the Game Boy one is what he got me. In the end, I really enjoyed the Game Boy version, and I'd say I like it even more than the NES one I originally wanted. In 1991 I got a Sega Genesis for Christmas. I talk a bit about getting the Genesis in this article I posted way back in 2013. The commercials for Sonic the Hedgehog had me hooked, and it was pretty much the only thing I wanted for Christmas that year. Sonic was awesome, Mario was lame, and Genesis does what Nintendon't. Sonic the Hedgehog came packed in with the system, so it was easily the hottest thing on my Christmas list. When I opened it, I remember reacting to it in a way only rivaled by the Nintendo 64 kid. I screamed and spun around on the ground in circles. I was, more or less, a huge dork. I was excited! It was the Sega Genesis for cryin' out loud. I got Spider-Man from my grandma that year as well. I had to open it in the bathroom so my cousin wouldn't feel shafted on his present, which was no doubt far less interesting than Spider-Man for the Genesis. It was probably a football or something. I don't know. I was still super into comic books at this point thanks to the previous year's Christmas gift of the beginner's box, so this game hit me at exactly the right time and only fueled my comic book lust. Easily the best Christmas of all, game-wise. This is the year that I decided the Genesis just wasn't enough for me and I had to have the Super Nintendo. Super Castlevania 4 was from bio-dad (he actually got me what I asked for this year) and Link to the Past was from my grandma. Everything else was given to me on Christmas morning from my parents. Street Fighter 2 was the game that made the Super Nintendo the must-have item. I couldn't play it on the Genesis I had, so I had to have the SNES. Other games had me really wanting a Super Nintendo like Super Mario World and ActRaiser, though I wouldn't get ActRaiser until my birthday two months later. It was an overwhelming Christmas. I mean, I got a Super Nintendo along with Super Mario World, Super Castlevania 4, Street Fighter 2, and The Legend of Zelda: A Link to the Past, a game which is still to this day in my top 5 favorite games of all time. It was almost too much! I also got Sonic the Hedgehog 2 this year, but I had already moved on to the Super Nintendo. And I hadn't even opened it up yet. 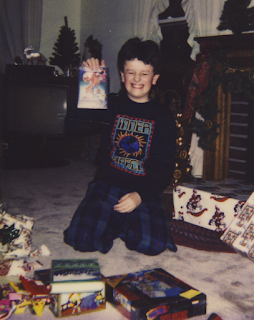 Christmas of 1993 was one I was so excited for. I woke up so early that after I opened presents my parents went back to bed. I got a Sega CD this year (which to a lot of people wouldn't be that impressive, honestly) and I was so excited about it. I had missed an opportunity to get one a year or so earlier, by instead opting to go to the comic book store. At the time, I would have ended up getting a model 1 Sega CD which would have been awesome, but no. I had to have my comic book fix. I also have a vague memory of being at my grandparents' house and them giving me Tournament Fighters, which I was also excited about. Because in 1993 I still liked Ninja Turtles. I still do in 2015, to tell you the truth. Donatello 4 life, son. As far as I can recall, I only wanted these two games for Christmas this year. However, these are two games I really enjoy! I had played both of them at a friend's house prior and I was completely blown away by Donkey Kong Country. Nintendo had even sent out a video tape about it before the game came out that added to my hype. Also, Blackthorne was just a cool game. I never really liked Prince of Persia or Flashback all that much, but Blackthorne was the best. Fun aside: My girlfriend was born in 1994, the year Donkey Kong Country came out. I met her 20 years later at work... while I was playing the same copy of Donkey Kong Country I got on Christmas morning 1994. The first thing we ever spoke about was this game. She told me how it was one of the first games that she had ever played. This was an interesting Christmas, because both of the games I got on Christmas I was kind of disappointed in. I found Donkey Kong Country 2 to not be as good as the first one, and I thought Pitfall was too difficult. I did eventually grow to enjoy both games (to a point), but I do remember being a bit bummed that I didn't enjoy the two games I asked for as much as I had hoped. I know it's an unpopular opinion to poo poo all over Donkey Kong Country 2, but... yeah. Not a fan. You know, I don't remember much about this Christmas. I don't even remember any of the other gifts I received. Probably some Magic cards. No, that was the year before. Hm! I don't know! 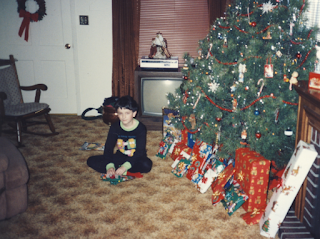 The first Christmas where I owned a Nintendo 64! Cruis'n USA was actually the second game I got for the Nintendo 64. It's odd to me that I wanted it as much as I did because I'm not a big racing fan, but I was all about it. I hadn't even played the arcade version, so I'm not really sure where this love for Cruis'n came from. Writing this also unlocked a memory. While opening presents, I opened Kirby Super Star and was thrilled. I'm a huge Kirby fan and Kirby Super Star is probably the finest Kirby game in existence. A few presents later I opened another copy of Kirby Super Star. I must have made a confused face because my mom was all, "Is that not the right one?" So I held up both copies of Kirby. "I don't know how I did that. I can't believe I bought the same game twice." As an adult, I wish I would have kept that and just kept it sealed. A factory sealed copy of Kirby Super Star would be a pretty nice piece in my collection! But as a kid, priorities are different, so we took the extra copy back and I got Earthworm Jim 2. I listed it up there in the list of games I got for Christmas, but I didn't actually get it on Christmas day. On this Christmas, I got two games for the Super Nintendo that ended up being pretty rare and valuable. I also got Diddy Kong Racing, which was my third Nintendo 64 game. Remember, Cruis'n USA from last Christmas was my second Nintendo 64 game, Diddy Kong Racing was my third. Nintendo 64 was... really cranking out the games. Of the three games, Diddy was the one I played most of all. I really, really enjoyed it. I've never been a big Mario Kart fan (except Mario Kart 8, that game is phenomenal) but Diddy Kong Racing really grabbed me as my go-to kart racing game. Castlevania and Kirby got some serious play, too. The real winner in this batch was Pokémon, but when I wasn't playing that, I was playing GoldenEye. Pokémon was life changing. I got an atomic purple Game Boy Color for Christmas this year, and Pokémon Blue never left the system for quite some time. I took it everywhere. I have a lot of memories of taking my Game Boy Color to school and playing Pokémon in study hall. I even got some Pokémon figurines this year, because I was swept up in Pokémania before I even played the game. Castlevania Legends... eh. I think I mainly wanted it because it was a Castlevania game. I've never been that impressed with it, especially when there's Pokémon Blue to play! This is a weird Christmas, to tell you the truth. I asked for an odd variety of games. I didn't like Bomberman Hero as much as Bomberman 64, Resident Evil 2 was not quite the experience found on the PlayStation, and WinBack is... quite an odd choice and no replacement for Metal Gear Solid. I did play through Resident Evil 2 despite its flaws, and Shadow Man ended up being my favorite game of the bunch. I think Christmas day was spent mainly playing Donkey Kong 64, though. There are, what, a million collectibles per level? I was probably doing that all day and night. And that's it! I could go into 2000 through 2009, but I don't think it would be as interesting. Not that this article was all that interesting, but still! It's Christmas and I wanted to do something! So I hope you've had a good day today and maybe this little feature made you think about the games you got on Christmas day during your childhood. 'Tis the season. Happy holidays!